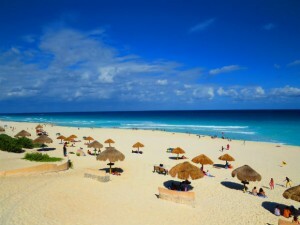 Cancun has many white sand beaches with warm clear water, perfect for taking pictures and relaxing in the sand. Knowing which ones to visit may be a hard if you’re not a frequent traveler to Cancun or a local. But don’t worry, we have you covered. Here are the 3 best beaches in Cancun with something for everyone. Looking for a chair in the sand and a bucket full of beers while you stare out into a pool like ocean? Playa Norte in Isla Mujeres is your spot. With plenty of restaurants offering full service on the beach; complete with chairs, umbrella, restrooms, and tables for food and drinks, this beach is the perfect spot to relax all day with a cold beer and nachos. A short ferry ride away from Cancun, Playa Norte always has calm waves and great sun. 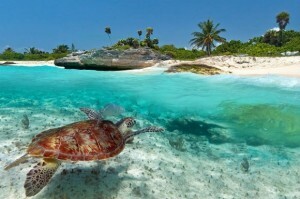 A small town located an hour outside of Cancun offers you crystal blue waters with plenty of ocean life to explore. With a restaurant on the beach and a small dive shop to rent snorkel gear, Akumal is the perfect day trip for those looking to do some snorkeling and relax under a palm tree. If you just want an amazing view of turquoise waters with great waves and no distractions, this is your beach. Located in the Hotel Zone, Playa Delphines offers palapas (umbrellas made out of dried palm leaves), restrooms with showers, and playgrounds for the kids. Bring your sunscreen and towels and prepare for a perfect beach day of fun in the sun. Whether you want a day of pampering, snorkeling, or just a day in the sun with some great waves, these beaches should satisfy all of your wants and needs for your Cancun vacation. Don’t have a vacation booked yet? Don’t worry! Book now.